We meet for worship every Sunday at 11am. Holy Communion is celebrated on the second and fourth Sundays; the first Sunday is less formal Family Worship and there is a Methodist-led service of the Word on each third Sunday. We also have Evensong at 6pm on the first Sunday of each month. Messy Church (hugely popular!) is celebrated every quarter in the Commemoration Hall, Slaley. The next Messy Church is on Saturday 16 June at 9.30am. St Mary’s has united Anglicans and Methodists in the village since Advent Sunday 2017. We feel that our union is both happy and creative under God. Mrs Carola Prior-Attree (PCC treasurer) 01434 67356. Mrs Susan Allen (Secretary). During the mid-1990’s this land to the north of St. Mary’s was given to the parish by Dr. Rachel Wraith, who then lived in the old vicarage to the west of the church. In 1999 the ground was consecrated as part of the churchyard by the Bishop of Newcastle, the Rt. Revd. Martin Wharton. This extension site would not be required as a burial site for a number of years and so a way of making use of the land was explored. Out of this came the St. Mary’s Wildflower Project. Meadow land used to be the most common habitat in lowland Britain because it was essential to provide Winter fodder for thousands of farm animals. The meadows were undisturbed by ploughing with each year repeating the same routine of cutting and removing the crop in mid-Summer, this cycle being continued from decade to decade. With such usage the soil remained poor but supported a rich variety of wildflowers and grasses because these thrive on poor soils. The Project was launched in September, 2001 in partnership with Slaley First School. Advice on the viability and management of such a project was first sought from a number of bodies: the Environmental Officer for Northumberland County Council, Northumberland Wildlife Trust and the Cramlington Organisation for Nature in the Environment, all of whom were generous with their advice and expert knowledge. To begin the Project, the children of Slaley First School and a number of members of the Community planted ox-eye daisy seed in pots and nurtured the resulting seedlings throughout the following spring. Also at this time the hedge at the Eastern end of the site was begun using beech and hawthorn. 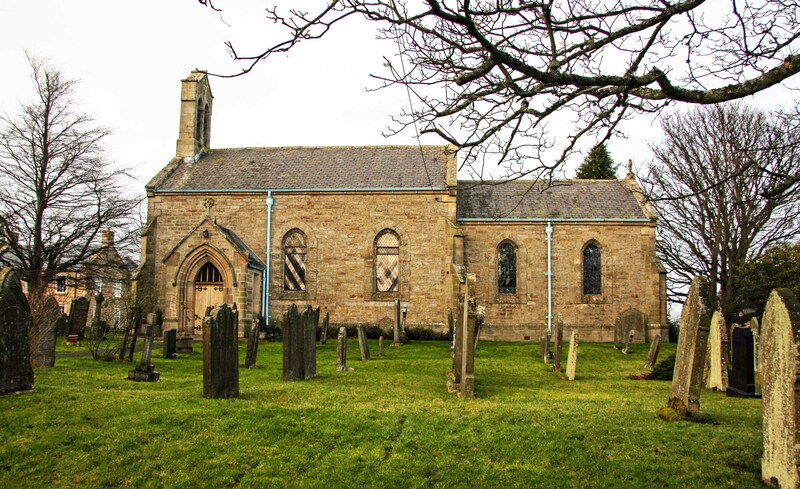 Further seed planting of a variety of wildflowers took place early in 2002 and the children of Slaley First School used the Project as a cross-curricular resource which included written pieces, art work, mathematics and a 3-D model of St. Mary’s and surrounding churchyard. In July of that year, the children planted out the first wildflower plants and this was followed by a special end-of-term picnic. Our guest for the afternoon was David Brookes of Northumberland Environmental Partnership [NEP]. Later that year, the Project attracted funding from NEP through the land-fill tax scheme. That winter a rowan tree was added to the hedge corridor. In 2003 alder, dog-rose, hazel and holly were added to the hedge. During the year three benches were installed for the benefit of the public. Planting continued in following years although most of the present flowering area was planted up by the end of 2004. In the Spring of 2005 a birch, cherry and field maple were added. By Summer 2005, many of the plants had matured and gave a magnificent display of colour throughout the season. There has been a significantly increased presence of bees, hoverflies and butterflies giving added enjoyment to all who visit. In the autumn of 2005 a notice board was installed to give visitors information. As well as being a haven for wildlife, the Project has provided a secluded wildflower garden full of colour and beauty, not only for members of this community but for all who visit St. Mary’s. St Mary’s was built in 1832 and replaced a medieval earlier church itself rebuilt in 1312. A fine seventeenth and several eighteen century grave monuments survive. The church was extensively repaired in 1907-8, when most of the present furnishings were put in place. The fine pulpit is by Ralph Hedley. The 1907 porch was repaired in 1999. The striking First World War memorial, west window, is by A.L. Moore and Son. A kitchen and toilet was also added in the 1990s and some pews were more recently removed to allow more space at the east end of the church. The lych gate was built in 1921 as the village’s war memorial.